We are excited to announce several new features to the WebReserv Booking Calendar and Booking System. The new features applies to all types of businesses, so whether you are using WebReserv as your Bed & Breakfast Booking System, Vacation Rental Booking System or for rentals and tours, we’re sure you’ll enjoy these features. We have implemented a new Reservation Management System that significantly improves load time for both the Booking Calendar and the Administration system. With the latest update you are now able to register a payment immediately at the time of reservation. 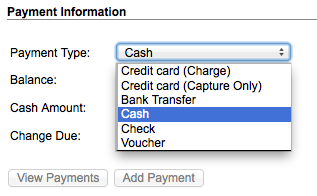 To register the payment, just select the appropriate payment type under Payments and enter the payment amount. You can even add check numbers, voucher numbers and other references. Register payments easily in the WebReserv Booking System. As always, you can charge credit cards immediately (charge) or capture the credit card for later processing (capture only). If you are using the minimum/maximum time in advance setting, the booking system now automatically determines when to allow reservations in the booking calendar based on your timezone (rather than EST/EDT). You can set your timezone under Setup – Business Information – Advanced Options. The new Booking Calendar now supports the productfilter. This is useful if you are showing different rentals or tours on your website and want to show the Booking Calendar for those rentals/tours. We have also improved the quality of pictures in the new Booking Calendar. If your pictures are not as “sharp” as you’d like, just delete your existing pictures and upload new pictures. If you’re still using Booking Calendar 1.0, do take a look at the new Booking Calendar 2.0. It’s amazing. We hope you will enjoy the new features. This entry was posted in Bed and Breakfasts, Booking Calendar, General, New Features, Payment Systems, Tour Bookings and tagged booking calendar, tour booking system, vacation rental booking system. Reblogged this on Electronic Payment Devices.